For more than 20 years, Alpha Paws has enriched the lives of families and their dogs through effective dog obedience training. Teaching people how to communicate with their dogs, essentially how to read and speak the language of “Dog“, has enabled families to share a compassionate and loving relationship with their canine companions. It has allowed the dogs and their owners to develop a mutual understanding of their respective needs and how to best satisfy those needs. In turn, this environment leads to a calm and happy – and obedient – dog. Peter Brown decided to establish Alpha Paws in January of 2001. 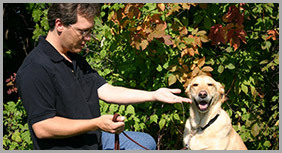 His years of study and practical experience have allowed him to acquire a thorough understanding of dogs and their behaviours, and his extensive training and involvement in various fields of animal care, ranging from dietary aspects to obedience training, makes Peter a very capable and proficient instructor to work together with you and your dog. Since 2001, Alpha Paws has provided obedience training for more than 1000 dogs. Exceptional service and exceptional results have led many dog owners to be repeat customers! 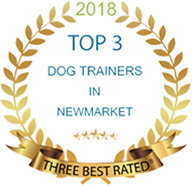 Our customized dog training programs make us the first choice of dog obedience and behavior modification training in Southern Ontario. A dog needs a defined alpha leader in its pack (or family) and if you are not that leader, the dog will accept that role. This can lead your dog to exhibit a wide range of inappropriate behaviours such as repetitive barking, pacing, and refusing to sit or lie down. These negative behaviours can cause a considerable amount of frustration and anxiety within the household. At Alpha Paws, our dog obedience training programs replace this frustration and anxiety with mutual respect, communication, and understanding, as the owner and dog work together to become a team that learns to communicate and satisfy their respective needs, and to fulfill their respective roles within the pack (or family). When the dog is able to relax and let you take charge – let you become the Alpha leader – they are much less inclined to misbehave. One of the major distinctions of our dog obedience training programs is that all lessons are private, one-on-one sessions. This allows the dog and the trainer or owner to communicate in a focused and distraction-free environment. In addition to learning how to communicate all of the basic commands (including sit, stay, come, go back, etc.) and proper doggie manners, you will receive a fully-customized program designed to suit your needs and the specific needs of your dog. We look forward to working with you and your dog! Contact us for your free consultation to learn how our obedience training programs can strengthen and transform your relationship with your dog. Call us today at 905-830-9500 or toll free at 1-877-868-PAWS or complete our Free Assessment Request Form. "Our dog Nelly is a six month German Sheppard and is the most calm and smartest, exellent behaved Sheppard I have ever seen or had, thanks to Peter at Alpha Paws..."